I wasn’t going to write today, since I pre-wrote and posted my daily ramblings last night. But, I just decided to go ahead and write again anyways. I have so many ideas always in my head I truly could post hourly. But, I have other obligations. Like tending to my earthly treasure — my son. So I will try to pace myself for his sake and spare you my hourly ideas. After having had two lovely daughters together and living happily as a family of four, my husband and I decided we wanted to keep the pitter patter of little feet in our home a bit longer. The girls were 8 and 11 and we knew time was marching on, so we decided to add one more. God blessed us with our son seven years ago, the cutest brown-eyed curly haired boy you’d ever see. At least we think so! But, I must say, after having sweet little girls, I was not prepared for the noise, the big personality, and all the stuff boys do. I didn’t have a quiet, sweet, studious boy. I had a spirited boy with a quick wit and a dramatic temperament. He has a twinkle in his eyes that lets you know he is up probably to something! I know he is going to be a great man someday. But he also has a tender side, mostly saved for me, and I melt when he slows down enough to hug me. One of the things I really looked forward to before he was born was decorating his room. My husband spent hours painting a beautiful mural from The Lord of the Rings on his wall. If I had a digital photo, I would post it. Now, after moving, he has a new room and of course, we had to create another room for him! Pity! You know I loved the opportunity. I was introduced to a really lovely site for boy things … I found it while perusing another blog I am enjoying now (when you are new to blogging, everyone’s blog is new to you! ), Design Mom. There was a quote on the Simply A Boy site (check out their charming wall hangings!) that so appropriately describes how I feel about decorating for children. As moms, I think we should introduce our children to the concept of taste and beauty, interpreted through the richness of childhood fantasy and imagination. Children’s rooms can handle themes in a way most rooms can’t. They are my “no theme room” exception! 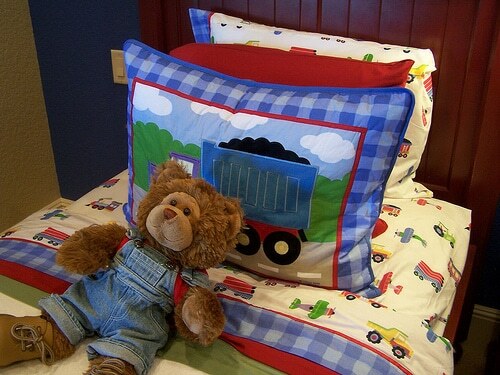 But if you do a theme room for a child, try to find a theme that will endure for many years. Kids go through phases like they go through shoe sizes. If your child currently can’t get enough of Sponge Bob, that doesn’t mean that he will love it next week. Frame a picture of the cartoon character and set it on his nightstand. Seeing that picture of a smiling Sponge Bob every morning on his bedside table will make him happy and you won’t have to live with gaudy yellow Sponge Bob comforters. Have a bulletin board in the child’s room and let him plaster it with Spiderman comics. Let the child have free reign over the back of their door or inside their closets. I designate those areas for easily changing creative pursuits. Install shelving in the room where action figures can be stored and viewed. This gives the child a place to showcase their current loves. Once I have acknowledged my son’s current interests, I can let the rest of the room breathe with a fresher, more enduring style. Whimsical or vintage interpretations of appropriate themes can work well for children’s rooms. I think fanciful yet tasteful things should be a big part of children’s rooms — you can’t possibly be too creative in making their room special and memorable. Childhood is about having a vivid imagination, so their room is a great place to reflect who they are and to train their eyes to recognize truly wonderful things in the world. If your child is fascinated by sports, for instance, you can find wonderful vintage photos, mobiles or murals to accent his decor. Choose a yummy selection of colors for the walls and bedding and have fun with the accessories. 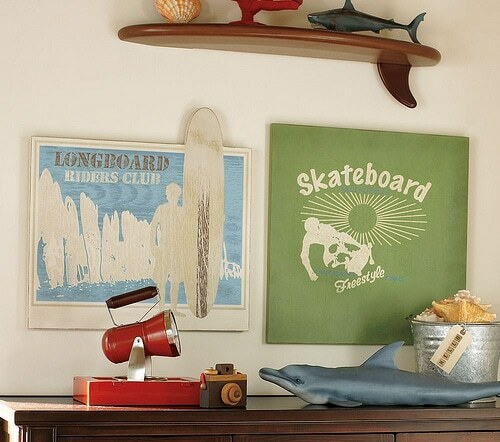 Somehow I think vintage inspired things look so fun for kids’ rooms. Or, if you prefer a more contemporary look, find whimsical things to add a youthful slant to his room, while keeping the basic furnishings and bedding free of overkill trying to illustrate the theme. Often times you can incorporate a teachable aspect to the things around the room. Give your decorations a purpose and the room will evolve on its own. 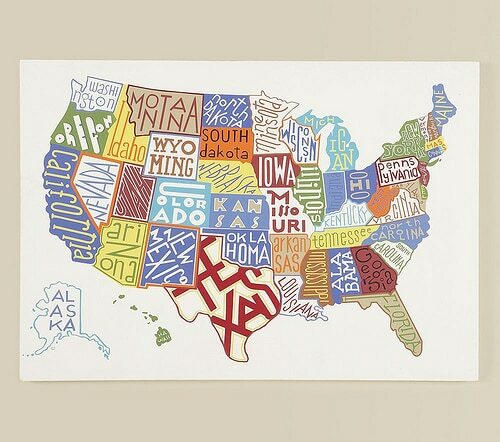 Try adding a wonderful world map or educational poster to stretch his little mind. Put a jumbo ruler in the corner to keep track of his growth and teach him about measurements. Add chalkboards to foster creativity. Have memory boards to remind children of happy times and special achievements. Have lots of books to encourage reading and discovering new things. And of course, frame family photos to show how much he is loved. 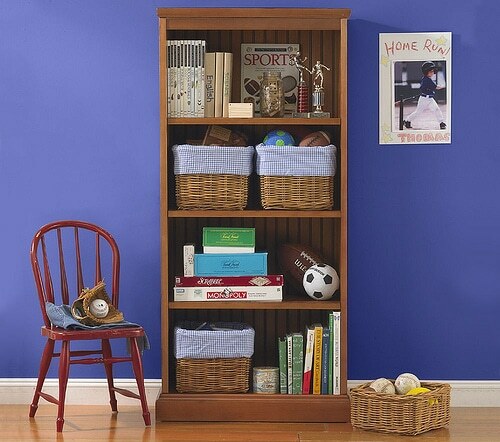 August is the perfect month to start focusing on your child’s room. September will be here before you know it! Thank you so much for visiting my blog and for leaving such a sweet comment. Yes, sharing my faith on my blog is the best part. The best – and most dear-to-my-heart comment about sharing my faith on my blog was from my sweetheart. And I value each new friend who comes my way through this wonderful and fun opportunity. Where do you live in Oregon? I’ve ‘met’ a new friend who lives just minutes from my kids in the Salem area. Since I’m not too far from there I hope to meet her sometime in person. I love the pictures and thoughts about your son’s room. My ‘little boy’ is a father of 2, soon-to-be 3, little boys. They grow up too fast and you wonder how it happened. God has blessed us with 2 wonderful grown children and 5 (6 in a few weeks!) grandkids. I am in Portland, let me know if you are ever passing through and we can get a little Oregon bloggers group together for a Starbucks! I am friends with Alicia (from Posie Gets Cozy) who is also here in Portland and we actually reconnected via our blogs! I am loving all the neat people I am getting to know. Makes it a much smaller world! Melissa, I am really appreciating your blog and thoughtful posts, and how timely for me as we just moved into a new house and my 5 year old son’s room is the first room to get a fix-up. Thanks so much! Have fun working on your little guy’s room! I’d love to see pictures when you get working on it! oh…thanks for the boy info. thanks for also visiting my blog! i had actually thought about the whole milk thing so…maybe i’ll try that. i also have two girls and a boy…my boy is like yours, though 2 years. he is very big and large in his personality…i love it. he’s a toot! i’m going to visit your links. thanks again and many blessings!